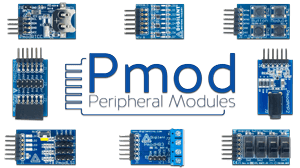 Flexible peripheral modules for all your designs. Pmod modules work on system boards that adhere to the Pmod Standard. The Pmod standard lays out guidelines for form factor, communication protocols and access to a target audience through reference manuals, code examples, user guides, and technical support. "Pmod" is the trademark of Digilent Inc. The Pmod Interface Specification is the property of Digilent Inc. For more information on the use of the Pmod trademark, please see our Pmod License Agreement page.